LDS scholar Michael Ash, author of the Shaken Faith Syndrome, presented a lecture on the Book of Abraham that is captured here in four parts (Part 1, Part 2, Part 3, and Part 4). Some heavy stuff, but helpful. Friday my wife and I attended an outstanding performance of The Music Man done by three collaborating high schools in Appleton (my kudos are elsewhere). Really was terrific. On the long walk back to the car, my wife recognized a young boy leaning against a van with a trumpet case. As a music teacher at Appleton's Classical School, she knows hundreds of young people in the area and is often stopping to chat with them. She asked him how he liked the play. He was a little downcast. "I came here and waited four and a half hours for my part, and then missed my cue and didn't get to play at all." He was part of the band of children that come onto the stage at the end. Apparently several of them missed the cue somehow in all the backstage confusion. It turned out well and most people would not have noticed that anything was wrong, but a number of young people left that night sad that an opportunity had been missed. Life can be that way. There are and will be moments we have been waiting for, moments when it's time to step up and apply our talents for an important purpose, perhaps even a dramatic ending to a complex play of some kind. At those moments, it's important that we be there, that we be alert, and that we be listening for what might be an easily-missed cue from a still, small voice. Then we must have the courage to act and carry out our part. We've all missed opportunities, some large, some small, but may we strive to not miss any more and to listen, to avoid distractions, and stay focused on playing our part well. After our steady and faithful preparation, when the cue comes, may we step on stage and give it our all. Today I met two men from China who are both studying at a significant Christian university. They were both strangers to me, but when I saw them, I sensed something special. It was more than just the vibrant glow that I see among many of the rising generation of China (don't ask me exactly what I mean by that, I'm not sure yet - it may just be a reflection of my own biases). How excited I was to learn that they were among the tiny minority of Christians in China. One of them told me about the house church he participates in, and spoke of his studies in theology that he hopes will help him to be better prepared in his future service. These converts to Christianity impressed me tremendously and reminded me of how much excitement will yet come from that part of the world one day as the message of the Gospel goes forth. With a son of mine on a mission in Taiwan, and with many dear friends over the year from China, I have a strong interest in seeing China, Taiwan, and Chinese people everywhere receive the hope and joy that comes with the Gospel of Jesus Christ. Thanks to the brave souls who participate in house churches and share the message of Christ to others. Thanks to the tolerant officials who understand that Christians are not enemies of China. Thanks to ministers and Christians of all faiths who make efforts to reach out to China and support wise, gradual efforts to pave the way for Christianity there. One day we may be overwhelmed at the opportunities we have to teach and bless. May we be ready. May we also understand the perspective of the skeptics in China who recall the abuse that China suffered in the past from Christians and Christian nations. There are barriers of distrust that need to be bridge cautiously and respectfully. One Chinese friend told me that historically, from his perspective, Christian missionaries are followed by gunboats and war. I don't think that will be the case in the future, but we must understand the pains of the past. This morning I did my part to help two ducks improve their terrible parental skills. Looking out the front door, I noticed that a male Mallard was standing bravely on our front lawn, looking as if he were scouting and surveying the area. Those dark beady eyes, those webbed feet - yes, it was him again. With a touch of compassion for this slow-learning critter, I did my part to help his parenting skills by opening the front door, staring him in the eye for a second, and then stepping toward the newspaper and picking it up. He called to his mate a few meters away and they both flew off toward the east. I hope I wasn't too late - I hope they didn't repeat the disastrous mistakes they've made in the past by building their nest and laying their eggs near our house. I first met these two ducks, or rather their offspring, when I was in my basement a few years ago and heard a strange peeping sound coming from one of our window wells. I looked through our tiny basement window and saw seven little ducklings that had fallen into the window well. They were hungry and cold. Some were near death. We looked for their parents and tried to get parents and babies back together again, without avail. We finally decided to try to nurse them to health, but only two of the batch survived over the course of the next few days. Eventually we took them to a local pond and released them. We would later add plastic covers to our two window wells to avoid this fiasco in the future. In spite of that disaster, the ducks came back at least twice over the next few years. Last year to my horror I found a nest of duck eggs just inches away from the window well that doomed their children before. The nest was pretty much in plain site, next to our house. It was really stupid. We tried to respect the parents' privacy and not disturb mom as she sat on the eggs to incubate them, but we humans have needs, too, like mowing the lawn. After one lawn-mowing episode, I guess mom was upset enough by the racket that she may have abandoned the eggs. Some ended up on our lawn and some seemed to disappear - perhaps the ducks found a way to move some to safety. The nest was empty with no sign of ducks after that. They vanished - until this year. I saw them fly into the neighborhood yesterday at dusk, but they landed two houses away, so I thought we would be safe this year. But seeing the male standing on the middle of our front yard as if he owned the place signaled that this experienced couple was planning more disaster for their offspring once again by returning to a familiar but dangerous place. I think they really like us and our yard, but this really isn't a healthy environment for their kids. So I did them a favor by spooking them this morning. Like I said, I hope I'm not too late. Some parents never learn, but they should. There are some influences and environments that are simply too dangerous for children. I'm tired of watching parents cheerfully waddle around as their kids drop needlessly into dark wells of immorality and other negative influences that will leave them cold and spiritually starving. All of us parents are flawed, but there is guidance that can help us avoid the pitfalls and bad environments that can harm our families. The Church is a tremendous resource of wisdom and guidance for families. The teachings to parents and youth, if followed, do so much to help our children and our families succeed, and to help us recognize how to find and create healthy environments for child raising. We were meant to be smarter than ducks in such matters. Thanks to over 50 of you (including some on another blog + email) for your responses to my previous post seeking input on cover design. As stated, at least one silver coin will be awarded. Given the response, I chose to award two silver dollars to two randomly selected people from the list. Toward that end, I went to the most attractive statistician I know (a woman who has a M.Sc. in statistics from BYU and shares my last name, coincidentally) and asked her to pick two random numbers to select the winners of the silver dollars. This resulted in selection of DANIEL and LORIN. Please contact me at jeff @ jefflindsay.com to confirm identity and shipping address. You can choose between a Morgan silver dollar or a Peace silver dollar, whichever you like best. Will be a regular circulated coin, not a rate date, but with solid value. I gained a lot from all of the comments, and the ones that put some thought and verbiage into their remarks were all excellent. The award for content was a very difficult choice. In the end, the one I selected to award with the bonus silver eagle is SilverRain. SilverRain, could you also contact me at jeff at jefflindsay.com for details on how to get your coin to you? Silver eagles are beautiful 1-ounce uncirculated coins minted by the US Treasury since 1987. I think they are one of the most beautiful coins of all time. And on further reflection, I am awarding a silver eagle as well to Briana. Congratulations! A bonus silver half-dollar goes to Michemily for being first and for raising the interesting Mormonad theme (not that I necessarily agree, but it was interesting!). Send me an address and I'll mail it to you. Your choice of Kennedy, Frankling, or Walking Liberty - all 90% silver. For all lucky winners, addresses will not be used for any other purpose - your privacy will be respected. But if you'd rather not, let me know and I'll pick someone else for the prize. You guys are good! I may try this again. So, should I get Nike or Adidas . . . aw, never mind. Contest closed now: winners announced here. I apologize for an off-topic post tonight, but I really need some opinions by Wednesday night (8 pm CDT, April 15). I need them enough that I'm offering cash prizes in the form of real money, not the fake paper stuff. I've asked a third party to randomly select at least at least one non-anonymous, unique commenter to receive a silver dollar for participating in this survey (two or more if I get at least 100 unique commenters). A one-ounce silver eagle may also be awarded based on quality of input. Here's the scoop. We've got a book being published by John Wiley & Sons in couple of months. Several cover designs have been presented, but the ones I like best are from local talent. We're trying to decide which of two differing approaches should be taken: the graphic (a maze) at the top (#1) or in the center (#2) of the cover. Two sample designs are shown below. Changes will be made in color and fonts, so don't let that influence you (but comments are welcome). I'm mostly looking for input on the placement of elements. Given that, please let me know which of the two designs you like best and why (single sentence may be OK). To de-emphasize color, I've also included a black and white version of both. I'm posting this on another blog or two as well. The comment that I find most helpful between these sources (I suspect it will be here) will receive a bonus of a beautiful American Silver Eagle one ounce coin. I know, I know, you think I'm just posting this to draw attention to silver as one of the smartest investments for people concerned about our hyperinflated future - but I really do need input from multiple eyes. Please let me know what you think - and be sure to login. If you don't want to register, make the comment with an assumed moniker and send it to me by email as well to identify yourself. Send it to jeff at jefflindsay.com. So which approach do you like best and why? Or let me know if they both fail and especially let me know if you have a better idea. The book, by the way, is a book aimed at inventors, scientists, managers, business leaders, and even policy makers. It deals with the personal side of innovation, exploring the many fatigue factors that can shut down innovation, along with guidance on how to overcome or eliminate them. 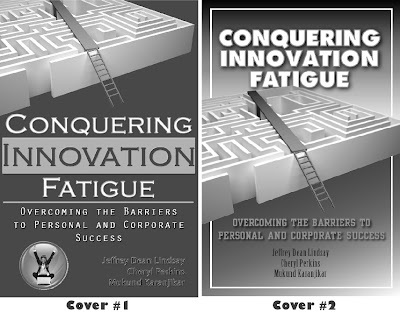 The maze image is intended to show that there are ways to bypass some of the barriers and frustrations on the journey to innovation success. Growing up in an atheist home, Michelle Bowden of England often wondered about God and religion. In "A Penetrating Light" in the Feb. 2009 Ensign, she describes an experience standing in Norwich Cathedral as a young girl, looking at a stained glass window, and wondering if God exists. It was an overcast day and the color were dull. Gradually, the colors of the stained-glass window became more vivid. A shaft of sunlight had broken through the clouds and was shining through the window. The light also seemed to penetrate my heart, filling every part of me with a warm and comfortable feeling. I had never felt anything so intensely wonderful and joyful. In the midst of this I had the assurance that God did indeed live and that He loved me. She would later encounter the same experience when she learned about The Church of Jesus Christ of Latter-day Saints, and came to recognize that the penetrating light that gave her both knowledge and joy was a manifestation of the Holy Ghost. I love the image she creates of looking at a stained glass window when the light is dull, and only appreciating it fully when the sun comes out. Have you ever noticed just how plain and sometimes even ugly a stained glass window can be when viewed from the outside? 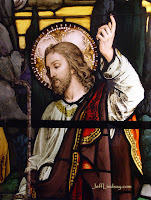 The Christian experience, and I would especially say the Latter-day Saint experience, has much in common with viewing a stained glass window. From the outside perspective of the world, it will seem ugly and nonsensical. To someone on the outside, a stained glass window can seem far less meaningful and certainly less useful than, say, a slab of concrete or cinder blocks. Only when the outsider is willing to contemplate things from a different perspective and look at the window from the inside out will there be any hope of appreciating the beauty we enjoy in our position. Even then, coming inside and shifting perspective is not enough. It may be dull and overcast, or even dark outside, and the window, while seeming slightly more interesting than before, still has relatively little appeal and meaning. An outside factor, a direct ray of light from the sun, must be present for the experiment to reveal what really is there in the window. When that light strikes the window and reaches open eyes gazing in the right direction, the window can come alive with color and beauty. Rather than being an ugly flaw as viewed from without, it can become an inspiring highlight rewarding those willing to simply look and see. If the outsider who comes in to look sees nothing meaningful at first ("OK, a little nicer, but not much"), a little patience may be needed. Direct sunlight may not be there at first glance. Try again, be patient and wait for the clouds to break and the penetrating light of the Spirit to reveal the beauty and meaning that is in the window that once looked ugly and absurd. Once you understand what the window is and what meaning is created by those numerous pieces of oddly shaped glass, you will understand that the experience of seeing it through the power of direct light was not a delusion, not a passing emotional whimsy, but a reproducible event that adds intellectual meaning and delight. With that new understanding, you can appreciate many windows in many different circumstances - all of which may seem like absurd defects to those never willing to experiment and see things from a new perspective in conditions where the light of the Spirit may be present. Wonderful News: Elder Joseph W. Sitati of Nairobi, Kenya - an Engineer! 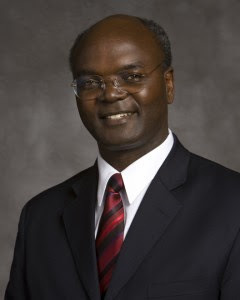 I'm very excited about the new General Authority, Elder Joseph W. Sitati of Nairobi, Kenya, who was just called as a General Authority of the Church to the First Quorum of the Seventy. Yes, it's wonderful to have someone from Africa among the leaders of the Church, and lots of people are cheering about that. But a big part of this story has been neglected by the press and many bloggers. Elder Sitati is an engineer. He has a mechanical engineering degree from the University of Nairobi. Now that's totally cool! I was traveling during General Conference today, but am grateful for the improved video coverage at LDS.org, which allows me to go back and replay the video broadcast from earlier sessions. Fabulous quality as well. I'm listening now to the Saturday morning broadcast, where I just heard the announcement from Thomas S. Monson regarding the selection of a new Apostle, Elder Neil Linden Andersen, who replaces Elder Joseph B. Wirthlin who passed away in December. I look forward to learning more about this respected man. If you're not used to LDS General Conference, it's a special event held twice a year for Latter-day Saints (and the world) to hear inspired messages from our leaders over a two-day period. Conference is held in the spring (around April 6) and again in the fall in October. There are two two-hour sessions on a Saturday and the following Sunday, with a Saturday evening session for priesthood holders (males over age 12). It can seem dull to many, but it definitely worth paying attention to. The content can inspire, guide, and bless when our minds and hearts are open. By nature, I'm an introvert. Love hiding in a corner to read versus walking into a crowd of people at a party. Filled with reasons to fear strangers, and plenty of neurons seem to be wired that way. Going on a mission took a lot of faith - no, going was easy. Walking up to people in Switzerland was the hard part. But during that experience, and over the years since then, I've learned something over and over that gives me courage to crawl out of my shell and even sometimes act like an extrovert: people are interesting. It has grown to the point where I look forward to meeting new people and enjoy chatting with strangers - there is always something to learn, something to take away. If I had a little more faith, there would more often also be something to give. I try, when it seems "feasible" and "appropriate," and have actually shared a few words about the Church with many people and have given away quite a few copies of the Book of Mormon. Too many times, though, I've done the Adversary's arguing for him, finding preemptive reasons why a person just doesn't want to hear anything about my religion or faith, and thus avoided the topic. That old fearful introvert takes over. Here's an example. On one flight, I was seated next to an attractive twenty-something female. She was absorbed in her Blackberry, hardly acknowledging me as I sat down. "OK, I'll respect her wishes and not bother her," I thought to myself. "Besides, she'll probably think I'm hitting on her if I start striking up a conversation." That was a weird thought, undoubtedly sexist - and not even consistent with my own behavior, since a few months ago I had a marvelous conversation with a girl of similar age who was a professional model on her way to a swimsuit shoot. (Learned a lot about modeling on the flight - and did tell her a few things about the Church. And no, I wasn't hitting on her.) So why should I alter my willingness to talk to someone on the basis of their age or appearance? But she seemed withdrawn, unwilling to talk, and yes, I do try to respect people's wishes. Halfway through the flight, as the flight attendant brought drinks and a snack (or was this the flight with the surprise glucose injections? ), it just seemed impossible for me not to say something. So I just glanced at her and said a of words - I think it was something like, "So, you going home?" Maybe it was something a little more intellectual, like, "Hey, are you on an airplane?" or "Wow, looks like we're moving." I'm not sure. But I finally broke the ice and acknowledged her existence, at the dire risk of offending the great vow of silence that I had vicariously taken for her. That simple act opened a floodgate. A flood of excited and energetic words followed - she loved to talk and was one of the most outgoing people I've ever met. She had a great story - quite a few of them. A fascinating person. It was one of the best conversations I've had on a flight. And yes, I got to share a little about the Church in the process - not much, but some. Reminded me that many of my assumptions about people reflect my own fears and biases rather than reality. I need to be willing to reach out more and share more. That brings us to the real topic of today's post, one of the great examples of thinking of others as sons and daughters of God who need the blessings of the Gospel, including the Book of Mormon. He is known by some as "Bookslinger," a man in Indianapolis who is on a mission to get the Book of Mormon to the people's of the earth in numerous languages. Bookslinger keeps a collection of Books of Mormon, and when he meets people, looks for ways to share a Book of Mormon with them, no matter what language they speak. He blogs about it at Flooding the Earth with the Book of Mormon. His most recent story, "It can matter where you do your laundry," illustrates his straightforward, thoughtful approach where his love of sharing overcomes the fear of rejection day after day. He's far beyond where I am, but it's a fascinating example to consider. It has inspired me to be a little more giving and brave. The introvert still takes over too frequently. So help me out: if you're sitting next to me on an airplane and I manage to drop a hint that I may have once been in Utah or something, make life easier for us both by just coming right out and saying, "Say, do you know where I can get a Book of Mormon?" I may have one ready to give - or as a backup, I could direct you to Mormon.org where you can order a free copy. But if you're really lucky, you'll be sitting next to Bookslinger. Let him know what language you speak, and he may just be able to reach into his backpack and help you out on the spot! A big tip of the hat to Bookslinger!